Doc Wilson poses with David Adelsheim at the International Pinot Noir Celebration at Linfield College in McMinnville, Oregon. 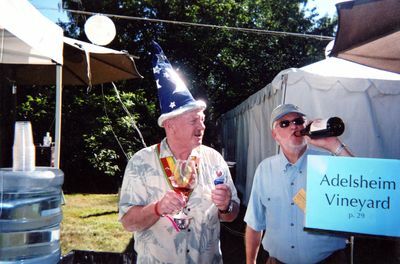 Adelsheim is the founder of Adelsheim Vineyard in Newberg, Oregon. Wilson is a Portland, Oregon culinary icon who worked as a sommelier at Jake's Famous Crawfish for 32 years. Doc Wilson Collection. Jereld R. Nicholson Library. Linfield College, McMinnville, Oregon. Courtesy of Doc Wilson, 2015. Unknown, "Doc Wilson with David Adelsheim" (2012). Doc (James) Wilson Historical Photos. Image. Submission 93.